The LHC has been handed over to OP, and powering tests should begin Monday. Here's hoping for a nice physics production year to round off Run 2. Last edited by dukwon on Mon May 14, 2018 4:52 pm, edited 3 times in total. 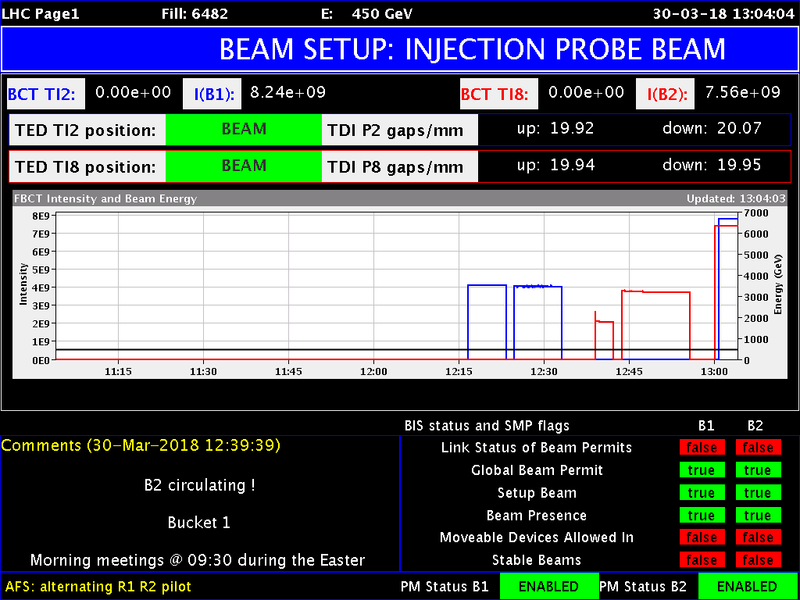 The short-term schedule is currently being driven by the intervention on the CMS pixel detector. The recommissioning is going very smoothly. Collision-finding should already take place this week, and first stable beams with 3 bunches could be as early as Monday 16th. There will be a scrubbing run either next week or the one after. First collisions (not stable beams) could be tomorrow mid-morning if loss maps and TCDI validation are performed during the night. ADT tests (necessary for train injections and abort gap cleaning) have been given priority over first stable beams w/ 3b, so the latter has been pushed back to Tuesday. Stable beams with 3 bunches per beam! We've had 3 fills with 75b, where the third was with BCMS beams. I believe the next step will be 300b. Currently scrubbing with 2605b. More scrubbing planned on Monday. Last edited by dukwon on Mon Apr 23, 2018 8:09 am, edited 1 time in total. We've had 2 fills with 339b. Scrubbing all of today until tomorrow morning. Then a third 339b fill with 48 bpi. Might switch to 600b Wednesday afternoon. Good news: the intensity ramp is about 7–10 days ahead of schedule, although some of that extra time may be spent on extra MDs. Bad news: the problem at 16L2 has not gone away, and seems to be identical to last year. It was responsible for 5 dumps during the scrubbing run yesterday. As a reminder: 16L2 stands for cell 16, left of point 2. Throughout 2017 there were a number of UFO-like events located between a quadrupole and a dipole in 16L2, which at large beam intensities would initiate a steady increase in losses over the next few turns until losses at IP7 caused a dump. It is believed that these were caused by air that had accidentally entered the pipe during the pump-down after EYETS and frozen to the beam screen. Warming up the beam screen in August made the problem worse, and the eventual solution was to operate with "8b4e" beams, referring to gaps of 100ns (4 empty) after every 8 bunches in a train. This mitigated the losses but unfortunately reduced the number of bunches from 2556 to 1920. During YETS, 16L2 was warmed to 90 K and approximately 8.5 g of gas was extracted, which, when analysed, was found to be consistent with air. However, as we saw yesterday, this doesn't seem to have eliminated the problem.